Get ready to take participation in one entertaining, but strange adventure. Some colored creatures are stuck and waiting for your help. Cut ropes or ice cubes and ensure the contact of every creature with its ice cube. 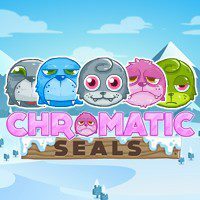 Chromatic Seals is very exciting game about colored creatures, that are waiting for your intrusion. The goal of the game is very simple. You have to cut ropes and ice cubes in order to connect both creatures and ice cubes of the same color. Each touch will make a solid block grey. If you want to get maximum points, you should use only few moves and finish the level.